Fr. John grew up in Mission, B.C., and after moving to Ontario with his family, attended Franciscan University of Steubenville. He has a degree in communications from the University of Ottawa and in philosophy from the Pontifical Gregorian University in Rome. He joined the Society of Jesus in 2008, after which he completed masters and licentiate degrees in sacred theology. 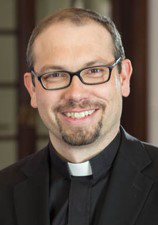 He presently lives in Toronto where he is the vocations director for the Jesuits in Canada.